1. Preheat the oven to 200°C, gas mark 6. Place the tomatoes, cut-side up, in a small roasting tin. Scatter over the garlic, chilli and half the chives then drizzle with the oil. Season and roast for 20 minutes or until softened. 2. Meanwhile, cook the bulgar wheat in the stock, covered, for about 15 minutes until tender and the liquid has been absorbed. Stir in the remaining chives. 3. 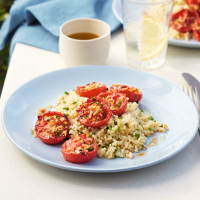 Serve the tomatoes on top of the bulgar, with the juices spooned over.